Cbet nr. 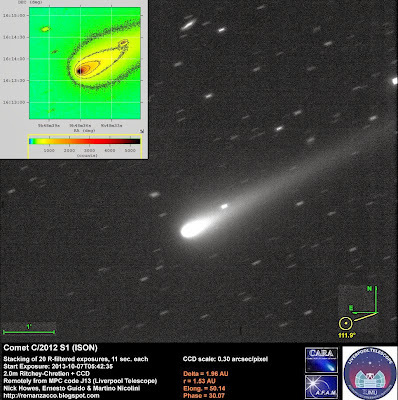 3676, issued on 2013, October 22, announces the discovery of a new comet (discovery magnitude ~18.8) by M. Schwartz on CCD images obtained with the 0.41-m f/3.75 Tenagra III astrograph. The new comet has been designated P/2013 T2 (SCHWARTZ). We performed follow-up measurements of this object, while it was still on the neocp. Stacking of 16 R-filtered exposures, 50-sec each, obtained remotely from MPC code F65 (Faulkes Telescope North) on 2013, October 16.4 through a 2.0-m f/10.0 Ritchey-Chretien + CCD (operated by Las Cumbres Observatory Global Telescope Network), shows that this object is a comet: sharp central condensation surrounded by a coma about 6" in diameter. Cbet No. 3674, issued on 2013 October 21, reports an outburst in brightness of comet C/2012 X1 (LINEAR). The magnitude of the comet was measured by H. Sato on on Oct. 20.5 to be total mag 8.5 (as measured within a circular aperture of diameter 85".2) with a brighter center about 10" across. 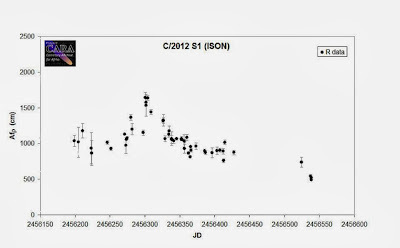 The predicted H_10 magnitude for C/2012 X1 (LINEAR) would be around 14 now. We performed follow-up measurements of this object on 2013 October 21.51. Below you can see our image of this comet, stacking of 3x20-seconds unfiltered exposures, obtained remotely from MPC code H06 (iTelescope Observatory, New Mexico) through a 0.50-m f/6.8 astrograph + CCD + f/4.5 focal reducer. 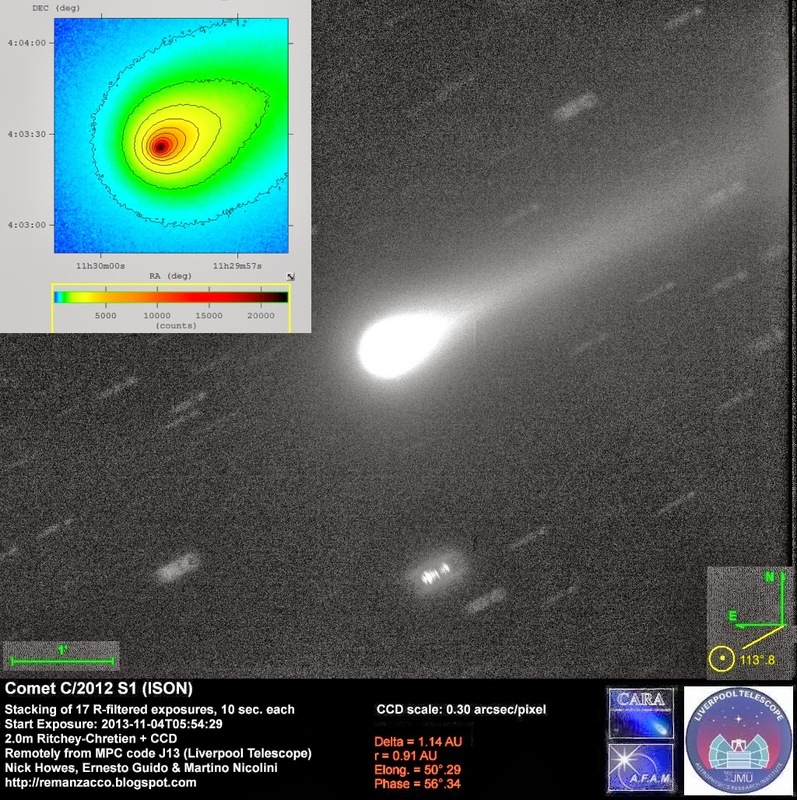 At the moment of the imaging session, the comet was just +16 degree above the horizon and the Sun was -11 degree. Click on it for a bigger version. The comet shows a morphology similar to the outburst of comet 17P/Holmes in 2007: the C/2012 X1 disk-like coma diameter is about 105" and the sharp central condensation is ~15" across with magnitude ~11. Below you can see an elaboration of the original image with the MCM filter. 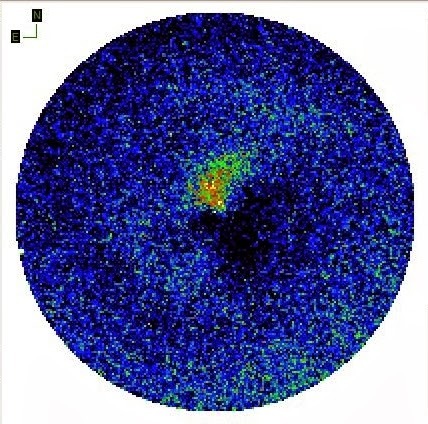 This filter creates an artificial coma, based on the photometry of the original image, and subtract the original image itself in order to highlight the internal zones of different brightness that are very close to the inner core and that would normally be hidden from the diffuse glow of the comet. 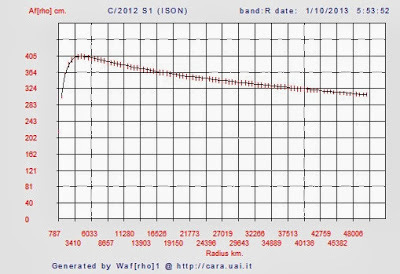 Below you can see the magnitude graph of C/2012 X1 (click on the image for a bigger version). Using our C/2012 X1 images of October 21 + the C/2012 X1 images of October 25 (kindly provided by Gianluca Masi) we calculated the dust shell expansion rate and compared it to that of 17P/Holmes during the 2007 outburst. The coma diameter increases from 113 arcsec to 202 arsec in about 88 hours (3.66 days). This corresponds to a projected radial speed of 1.01 arcsec/hour ( or 24.3 arsec/day) and, at the distance of 2.95 AU, to a speed of about 0.6 km/s. We can compare this speed with that of 17P/Holmes during its 2007 outburst where the expansion rate of the dust shell, also projected on the plane of the sky, has been found to be constant at a rate of approximately 0.554 +/- 0.005 km/s from October 25.8 to November 1.6 (Yi Lin et al., The Astronomical Journal 138 (2009) 625). Juno is a NASA New Frontiers mission to the planet Jupiter. Juno was launched from Cape Canaveral Air Force Station on August 5, 2011. The spacecraft is to be placed on July 2016 in a polar orbit to study the Jupiter's composition, gravity field, magnetic field, and polar magnetosphere. 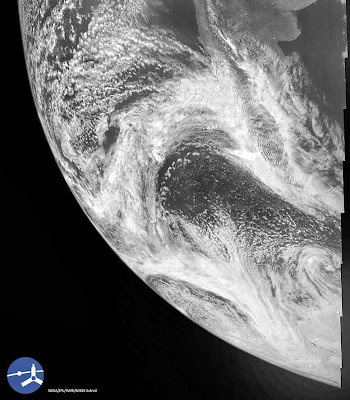 On October 9 2013, the interplanetary probe Juno flew past the Earth on its way to Jupiter to receive a "gravity assist" and be put on a trajectory to reach Jupiter in 2016. 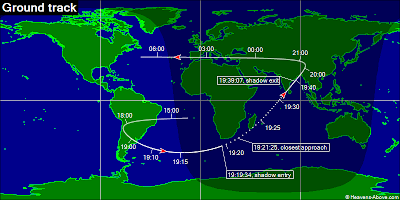 Time of closest approach with Earth (in shadow) was 19:21UT of October 09, at an altitude of only 559 km over the southern tip of Africa. 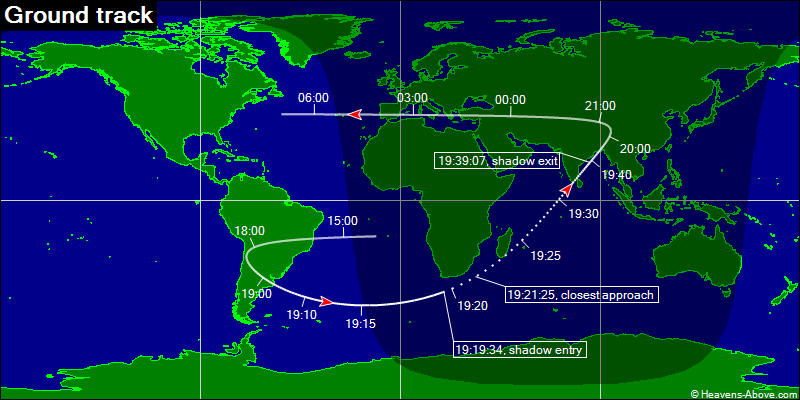 Then it left the eclipse at 19:39 UT and was visible from Europe and Asia (see graphs below). 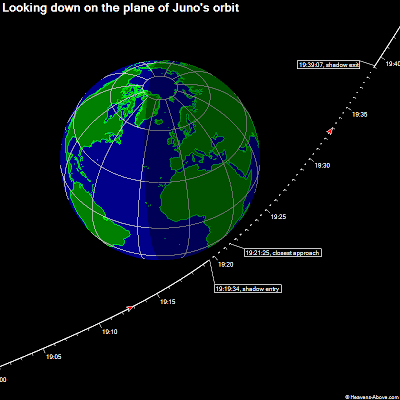 We performed follow-up measurements of Juno on October 09.9, 2013. 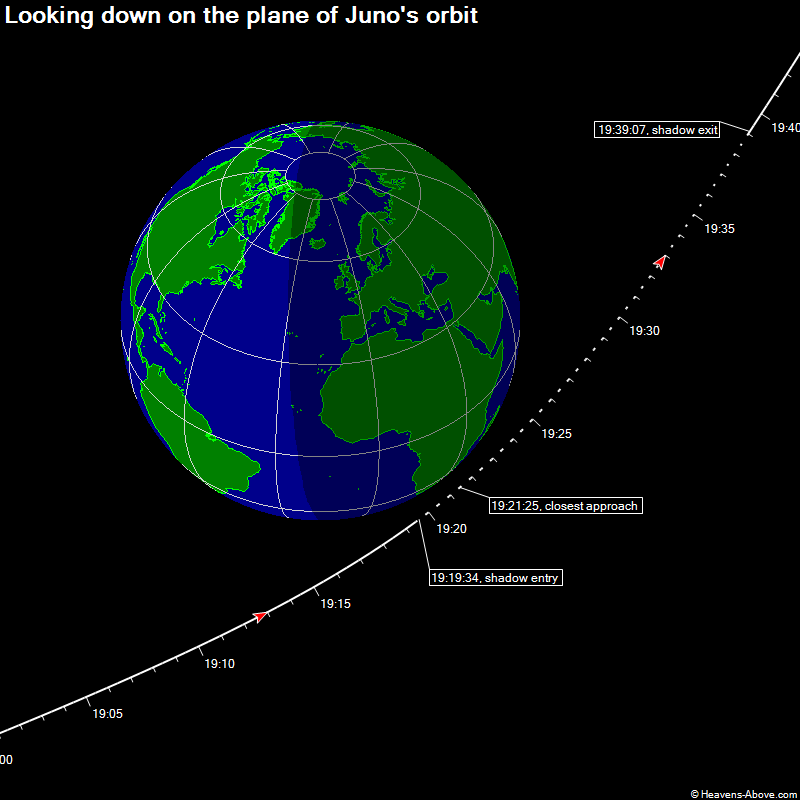 The spacecraft was then of at ~125,000 km from our planet, magnitude ~14 and moving at ~80"/min. Below you can see our image of Juno, single 120-sec unfiltered exposure, obtained remotely from MPC code I89 (iTelescope Observatory, Nerpio, Spain) through a 0.43-m f/6.8 reflector + CCD. The spacecraft is trailed in the image due to its fast speed. Click on it for a bigger version. A Pseudo-Mpec, using our follow-up observations and that of other observers, has been made by Bill Gray using his software Findorb. (the nominal orbit now impacts Jupiter... but with a large enough sigma that this seems rather unlikely. Especially assuming there will be a terminal correction maneuver or two, giving it an orbit that just barely skims over the north or south pole). NASA’s Juno Spacecraft returns 1st Flyby images of Earth, taken at 19:06UT of October 09, 2013 while it was flying over South America and the southern Atlantic Ocean. Click on the image for a bigger version. We obtained further follow-up on C/2012 S1 (ISON) on 2013, Oct. 1.2, through the 2.0-m f/10.0 Ritchey-Chretien + CCD + SDSS r' Filter of Liverpool Telescope (MPC code J13). Stacking of 20 exposures, 11-seconds each, produced an image where is visible a well developed coma and tail measuring at least 3 arcmin extended toward PA 297 deg. Click on the image for a bigger version. Below another elaboration of the same stacking. Click on it for a bigger version. In the image below you can see 3 different elaborations of the ISON inner coma. The first panel on the left is a Larson-Sekanina filter. 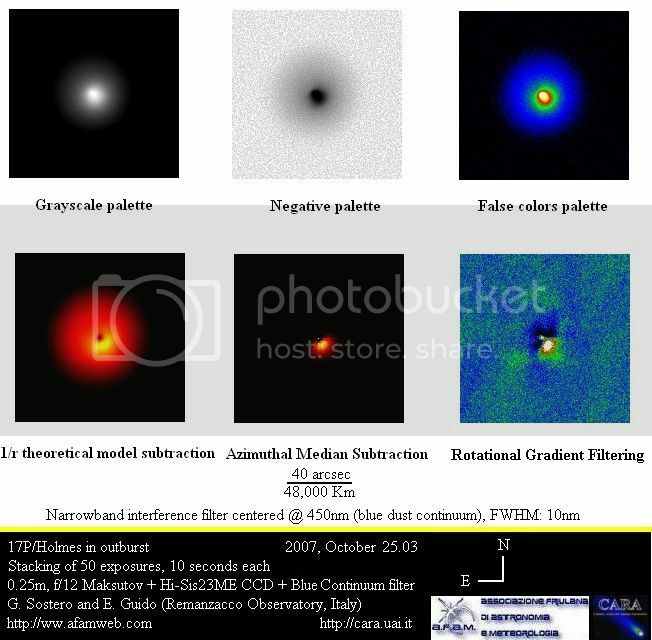 In the middle panel elaboration with the MCM filter creates an artificial coma, based on the photometry of the original image, and subtract the original image itself in order to highlight the internal zones of different brightness that are very close to the inner core and that would normally be hidden from the diffuse glow of the comet. 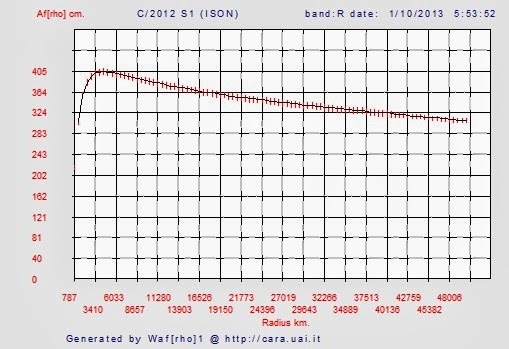 While the last panel on the right is the elaboration with filter RWM - 1/r theoretical coma subtraction. Af[rho is a proxy of dust abundance within the coma. It was introduced by Michael A'Hearn et al. in 1984 (AJ 89, 579, 1984) with the aim of comparing measurements concerning the dust continuum under different observing conditions, times and instruments. 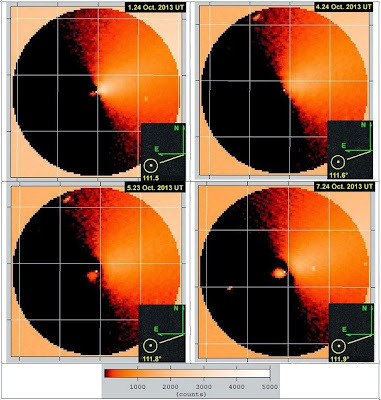 A first result obtained by CARA team from a preliminary analysis on comet ISON is shown in the two plots below: one concerning the observed Af[rho]quantity (where is evident an apparent peak related to the phase effect) and another with the log(Afrho) quantity corrected for the solar phase effect. Click on the images for a bigger version. On our data of October 01, 2013 we measured an Af[rho] value about 350 cm, for a corresponding aperture of nearly 20,000 km in diameter at the comet distance, confirming the fading trend. Click on the image for a bigger version. 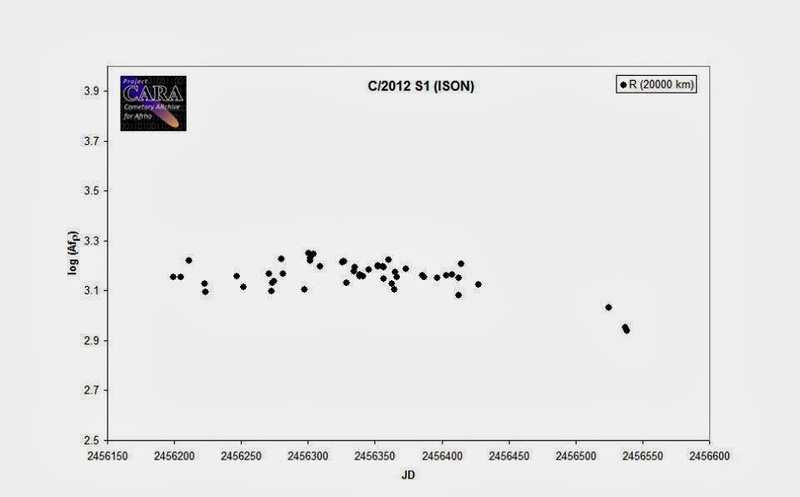 We obtained new data on comet C/2012 S1 (ISON) on October 04, 2013. The details are on the caption of the image below. 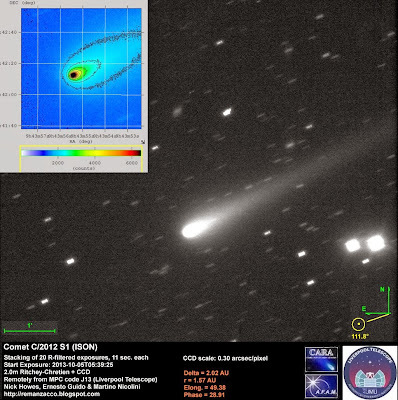 We obtained new data on comet C/2012 S1 (ISON) on October 05, 2013. The details are on the caption of the image below. We obtained new data on comet C/2012 S1 (ISON) on October 07, 2013. The details are on the caption of the image below. Here we present a preliminary analysis with respect to a sunward facing feature detected on comet C/2012 C1 (ISON) The feature imaged between 30th Sept 2013 and 7th Oct 2013 is clearly visible and reproducible in images taken over four observing nights we had with the 2.0 m. Liverpool Telescope between these dates. All images have the same integrated exposure time (being a sum of 20x11sec.=220sec at 2x2 binning on the CCD, yielding a pixel resolution of 0.3”/pixel.) In all image the same filter (SDSS R' band) and exactly the same false-color scale visualization using Astroart software has been deployed. After the usual dark subtraction and flat field correction using field data provided by the Liverpool Telescope (as on some nights, automatic calibration was not performed) and stacking on the photometric centre of the coma, we built a radial normalization model of the coma suing a plug in developed for this purpose within Astroart (The plug in is known as the M.C.M. or Median Coma Model). With this , we then subtracted the modelled image from the original image data to enhance any difference between the real and the "ideal modelled" coma. The results of this processing is shown in the four images detailed below. Each square is a zoomed in view of the full image, and each image is 30" wide, with each rectangular white grid scaled to 7.5"x10". The white pixel in the centre of each image is the brightest pixel inside the coma, known as the optocenter. The sunward facing feature, feature shows a maximum size on data taken on the 7th Oct reaching out to about 2.7 arcsec (about 4500 km at the projected plate scale) and also is notably almost absent on data taken on the 4 Oct, which we believe is due to adverse seeing conditions on this date at our site on La Palma. The seeing conditions for each night as measured are :1 Oct/1.1" arcsec, 4 Oct/2.1" arcsec, 5 and 7 Oct. 1.5" arcsec. 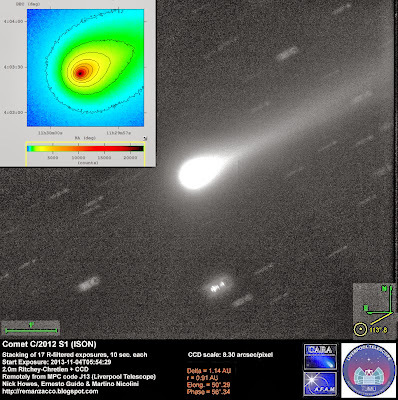 At this plate scale the sunward facing feature we believe cannot be associated with any degree of confidence with any nuclear phenomenon (eg/jets) but after careful analysis, we now believe it to be a typical cometary coma condensation. We therefore state that this feature is a cometary atmosphere feature present in almost all comets approaching the Sun and the Earth. We obtained new data on comet C/2012 S1 (ISON) on November 04, 2013. The details are on the caption of the image below. 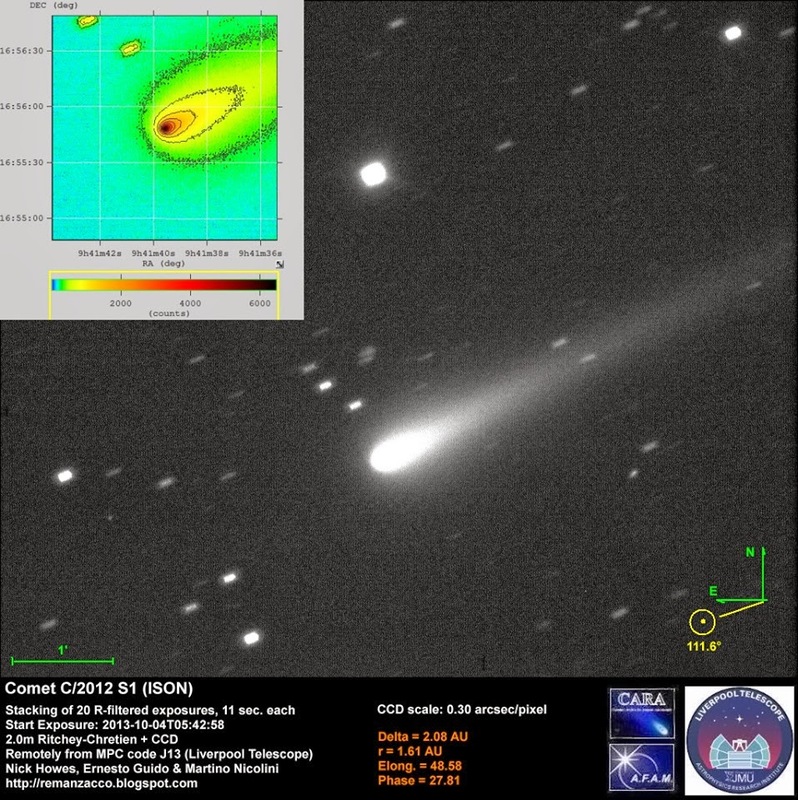 We obtained new data on comet C/2012 S1 (ISON) on November 11, 2013. DDP processed on the image to enhance the core of the coma and the thin second tail. The details are on the caption of the image below. Cbet nr. 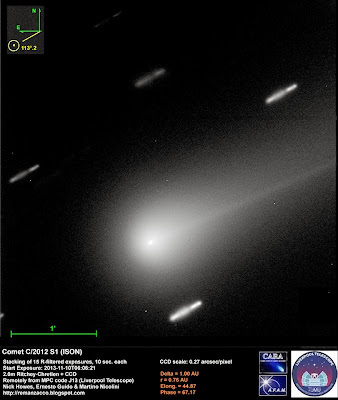 3658, issued on 2013, September 27, announces the independent discoveries of a new comet (discovery magnitude ~18.0) by the Catalina Sky Survey's 0.68-m Schmidt telescope (with no mention of the appearance of the object; observer R. E. Hill) and by Bryce Bolin, Jan Kleyna, Larry Denneau, and Richard Wainscoat from images obtained with the 1.8-m Pan-STARRS1 telescope on Haleakala. Bolin et al. wrote that the discovery images show two distinct nuclear components separated by approximately 3" towards a position angle of 240 degrees, and a diffuse tail that extends for approximately 14" towards p.a. 240 degrees. The new comet has been designated P/2013 R3 (CATALINA-PANSTARRS). We performed follow-up measurements of this object on September 28, 2013. Below you can see our image of this comet, stacking of 20 unfiltered exposures, 120-sec each, obtained remotely from MPC code H06 (iTelescope Observatory, New Mexico) on 2013, September 28.3, through a 0.43-m f/6.8 astrograph + CCD + f/4.5 focal reducer. Click on it for a bigger version.